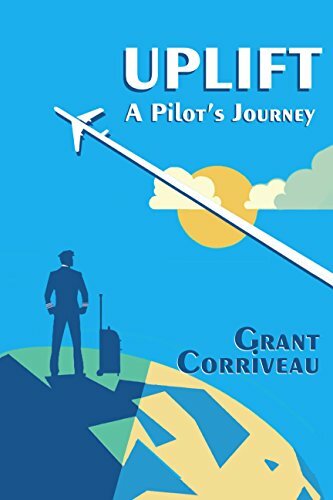 Take off with Captain Grant Corriveau in “Uplift – A Pilot’s Journey.” During your flight you will be fascinated by many true stories shared by Grant as he invites you to experience his life-long journey of discoveries. Captain Grant will reveal, through his story and rise in the ranks in the aviation industry, culminating in the pilot’s seat in the cockpit, that not everything we need in life is learned in classes and training seminars. Beginning with his earliest childhood fascinations with aircraft and the men and women who fly them, Grant welcomes you into his logbook consisting of 48 years of flying with a 30 year airline career as icing on the cake. You will be uplifted as you share an insider’s view of his passion and experience working for one of the world’s great airlines. As Corriveau advances through the ranks to senior captain he transparently shares his challenges, adventures and achievements. You will fly with him as he exposes his failures and doubts – his triumphs and close calls. 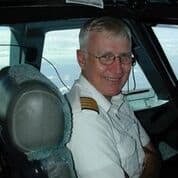 You will share the time when Grant’s dream almost ended then sit in the jump seat next to him as he candidly shares a pilot’s life of continuous training and adaptation to new technology and automation. “Uplift” is everyone’s journey, told through the eyes and experiences of one pilot’s career – one pilot’s journey. Come along for the ride and you will be uplifted. CLICK HERE TO READ THE FIRST CHAPTER OF "UPLIFT"
Over the years, he has learned to be thankful for the many people who helped him -- uplifted him -- along the way; family, friends, colleagues and strangers. He currently lives on Vancouver Island with his wife and greatest friend, France. He recently obtained his glider pilot license and enjoys sharing his stories through his writing. Uplift - A Pilot's Journey is a delightful, easy read. The self-deprecating humor is reminiscent of Dave Barry. Funny and fast-paced. I found it hard to put down. What a gem of a book. This book "Uplift -A Pilot's Journey" is a MUST READ. Not only is it entertaining, informational and educational, it describes the life of one person with a goal, a dream, or a burning desire to become an airline pilot. An aviation background is not a necessity in order to understand this author. Grant has written an entertaining memoir. Short anecdotal stories relate various experiences of one airline pilot who has a good sense of humor. It’s a great read. I’m sure you will enjoy it. If you want to have a feel for what it’s like to be an airline pilot, what it takes to get there and what to realistically expect along the path to becoming a professional pilot, read this book. - Over the years I’ve found that a lot of people are interested in aviation. This is an attempt to share the unique aspects of this job with the many aviation enthusiasts who are interested in what happens“up front” in an airliner. 2. Who did you fly for? Why is it not mentioned? - I flew for a great international airline with over 80 years of experience worldwide. I don’t specifically name the company because I wanted readers to relate to familiar airlines of their own experience. Also, I want to protect the privacy of my colleagues and characters in the stories. 3. What was (were) the highlight(s) of your career? - After the several months of initial training, I got to sit in the co-pilot’s seat of a B727 and fly a couple of takeoffs and landings. Later, as we were exiting by the back air-stair door I had to stop and turn back to stare at all that airplane that had been following me around the sky. Up until then I’d never flown an aircraft this size. - The first flight plan with My Name as captain. After all the years of training, and setbacks, finally it was real! I was an airline captain. 4. How safe/dangerous is flying? - Despite what the jargon and airline advertising might say, flying is inherently dangerous. But we make it relatively safe through continual effort and attention to detail. We make it as safe as the flying public demands as they vote with their dollars. Which is to say — it’s as safe as it needs to be to keep passengers coming back for more. There is a continual struggle by companies to remain profitable which is often the enemy of safety. We could totally eliminate all RISK if we stayed on the ground and didn’t fly. So, it’s all about risk management. Which is why we need properly paid and trained employees; properly funded infrastructure; properly regulated environment (not the wild west); and a travelling public who are aware of the costs of maintaining these high safety standards. 5. Your story spans several years during which there have been significant changes in the airline travel industry. How has the job of piloting an airliner evolved during this time? - The environment has become safer, more team oriented, more systematic. Systems have grown up, incorporating all the things we’ve learned along the way - the new technology. For example, we have significantly enhanced weather reporting and forecasting, more detailed maintenance plans, more automated equipment to help us to the job. So along with all this we have developed better training methods for the people who have to manage all this. 6. Do the computers fly the airplanes? What do the pilots do if the autopilot does all the work? - Automation has always been an excellent tool in the flight decks, helping us operate in poorer weather than we could have a few years ago. But automation is only a tool. It doesn’t care if it “lives or dies.” Aircraft computers experience the same limitations as your home computer. In aviation, automated systems are working in a 3-dimensional world where weather constantly changes, mechanical and electronic equipment fails, and “stuff happens.” There is no replacement for the instantly re-programmable, problem solving skills of a human being. I don’t see that changing too much because of diminishing returns. That is, the cost of increasing the level of automation becomes exponentially higher beyond a certain point. 7. Greatest accomplishment of the aviation industry? 8. Please summarize the message of your book and why we should buy it. This book is — on the surface — simply one pilot’s journey through a typical airline career. But, along the way, he discovers how intricately-connected and interdependent we all are. And how, together we can overcome obstacles; build wonderful adventures and grow (as individuals, groups, and societies) into something beyond our wildest dreams. We are on a grand journey and we can work together to make it amazing! This is true of each of us, no matter what we do in life.